Hopefully, no one actually reads my blog because then you'd know that just a couple of weeks ago I said I was going to post 4 or 5 times a week. How did a whole week slip past me? Anyway, the good news is that we found a wonderful house and we're closing June 8th. I can't wait to become a homeowner! The house is a little bit of a fixer-upper, so we'll have our hands full for the first few months. That's one of the reasons I love the house so much... once we get rid of the dated wallpaper and start painting, the place is going to look beautiful. I think that'll make the place even more special knowing that we put not only our hard-earned money into it, but also a little elbow grease. This will be the first place I've ever lived in that has a formal dining room. So that means we have to buy a nice big dining table and chairs. 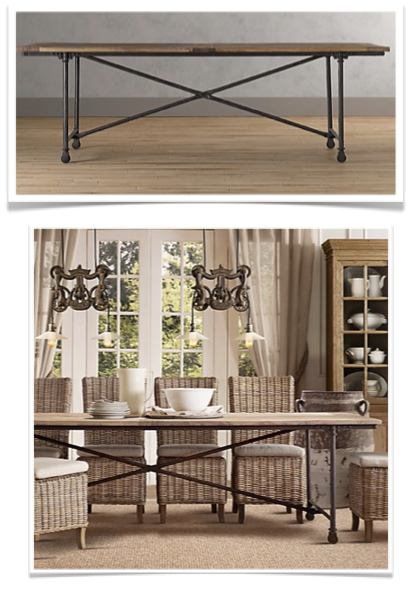 My husband isn't the type to get psyched about spending a bundle on furniture, but for some reason he's really into dining tables. 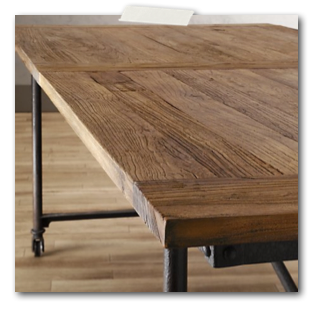 Over at Restoration Hardware they have this super cool industrial style table made from old barn doors and a steel base. I went to check it out in the store this weekend and the sales lady told me there are 52 people on the waiting list for it... just in Milwaukee! Really? I mean it's really cool, but I didn't think there were that many people in Milwaukee looking for a dining table. The price is a little steep (over $1,000), but it's so cool that we're actually considering buying it. 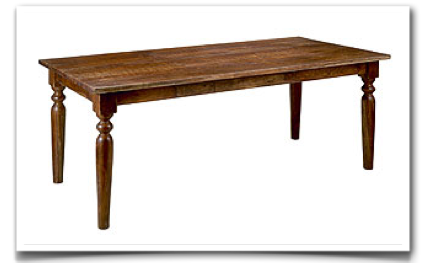 On the other end of the price spectrum is this nice chunky wood table from World Market. I feel a little more comfortable with the $500 price tag and I almost think it suits our style better. The last thing I want to do is spend a fortune on a table and then find out it really doesn't match the rest of the furniture in the house. Not that we really have any furniture at this stage. So now what I'm thinking is that we should search craigslist for a super cheap dining set. Paint and reupholster the chairs myself. Refinish the table. And not make a big investment in a table until we live in the house for a while and have a better idea of the style we're leaning towards. thanks Fatim. hope you're doing well. love such wood dining table! yes, they're irresistible, aren't they?